If you are still considering buying baby stuff, a task that is way too complicated for you to give it a go by yourself, we can help. Because we know just how challenging it can be to shop for baby carriers, we have decided to lend you a helping hand. As a result of our research, we have put together a list of high-quality models that have received favorable ratings so far. Moreover, these items are seen as practical, easy to use and likely to pass the test of time. So, start reading and feel free to make a choice! If you are interested in versatile baby products, the Infantino Flip 4-in-1 might catch your attention. Because of its design, this model can supply its users with no less than four distinct ways one can carry his/her baby in it. This choice is also convenient as it can be used with infants, with babies with head control and with older babies and toddlers. Therefore, if you purchase it, you’ll be able to use it for an extended period. When shipped, this option comes supplied with a cover that you can use to protect the clothes and the carrier with. This product is machine washable. Another ergonomic choice that is worth your attention is the Infantino Cuddle Up. This model can be used to carry a baby that weighs between 12 and 40 pounds. As a plus, the unit is very comfortable, and it can be used to transport a baby in two different ways, front, and back. The feature that most users like about this choice is the removable canopy hood that has adorable teddy bear styling that you will definitely like. As expected, this item can be machine washed so that you will not have to invest a lot of time cleaning it. This next product sold by Ergobaby is another model that might stir your attention. The unit has an ergonomic construction and it can be fully adjusted as your baby grows. To do so effectively, the option also includes adaptable buckles that can accommodate a baby that stays in the natural “M” position. Moreover, this choice is also good for the parent’s back as it features a wide wrap-around waist that guarantees lower back support. Consequently, it can be easily used even by moms that have had a C-section. Also, the padded shoulder straps can distribute the weight of the baby evenly. If you want to invest in a carrier that you can use as your baby grows from an infant to a toddler, check out the Ergobaby OMNI 360. The model can accommodate all types of carrying positions, and it can be worn on the hip and the back. Furthermore, the unit comes fitted with a storage pouch that you can utilize to store it when you are not using it. According to the seller, this alternative supplies the user with a custom fit as it can adapt to various body shapes. Additionally, because it includes a padded lumbar support waist belt, this carrier is very comfortable even when worn for long periods at a time. Another choice that you should take a good look at is this model designed and distributed by Baby K’tan. This alternative is made from 100% cotton, and it can be used right out of the box. Because of its versatility, it allows parents to choose from five carrying positions, following the age and the necessities of the baby. To make sure that its buyers get the most suitable option, this product can be ordered in different sizes. As a plus, because it is made from cotton, you can easily wash it. The item has a special design that makes it easy and safe to be utilized by parents that suffer from hip dysplasia when used as directed. Lately, it seems that most parents enjoy using baby carriers instead of classic carriages because they are more comfortable and versatile. You can use baby carriers until the infant reaches 20 pounds months but some mom and dads don’t mind toting their little one after this point. Babies can be transported in a stroller or a car seat, but there are people that enjoy the simplicity and the feeling of closeness provided by these baby carriers. These items cuddle your child against your chest and leave your hands free to move. The wonderful thing about them is that it allows you to navigate easily especially in the crowded areas and do your daily chores while your child sleeps or relaxes on top of you. If you want to know how to purchase cool baby carriers for your baby and your busy schedule doesn’t allow you to do proper research, let us do the job for you. Our team has done their homework and came up with some useful tips presented in this buying guide that will come in handy for both moms and dads. Based on the type of baby carrier, safety, and ease of use, we’ve discovered these features that will help you choose a product that meets your personal preferences and needs. Parents know how important their children’s safety is and are willing to purchase products that can make the process of raising them a tad easier. There are many baby carriers for sale that handle toddlers up to 60 pounds and are practical and easy to use. Have a look at these features that guarantee you a successful choice of product that both moms and dads will appreciate. If you’ve used a baby carrier before, you might find all the straps, buckles, snaps, zippers, and pouches a little bit confusing to handle. Don’t worry too much because once you get to the bottom of it, you will understand how all models work. 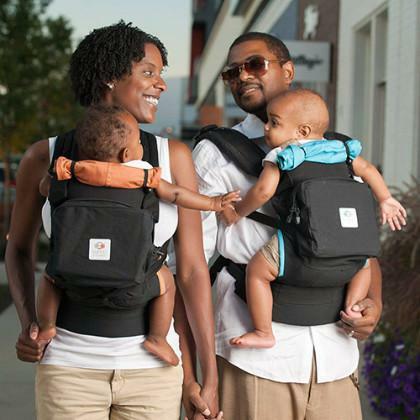 Before making a purchase, consider the type of baby carrier, their versatility, and sturdiness of the product. You might be surprised to find that some carriers match your body and your baby better than others. Generally, baby carriers come in 3 major categories: front carriers, slings, and wraps. Front carriers have two major shoulder straps that support the fabric seat. Hence, the baby stays quite close to your chest, and the newborn will always face towards you. If you’re breastfeeding, you should choose a sling that is basically a wide sash of fabric that goes from your torso to one of your shoulders. Wraps, on the other hand, are worn around your body and over both of your shoulders and have gained tremendous popularity because they are practical and can be adjusted for many combinations. It’s more than wise to consider how easy it is for a carrier to be used when changing the item from one parent to another. Most products available nowadays come in vibrant colors and flower patterns that might not suit the needs or tastes of a dad. Therefore, when looking for cool baby carriers for dads pick models that have adjustable straps and many pockets. Also, go with neutral colors and try to pick wraps because they are more efficient and don’t require a specific body size for the carrier. As far as functionality goes, pay attention to your choice of a baby carrier because you need to be able to put it on and take it off and get your baby in without help. Moreover, you can only use one hand because the other one keeps your baby safe. There are structured carriers that are specially designed to unbuckle easily when you want to put your baby in the crib for sleeping. According to the best baby carriers reviews, wearing your child makes him happier and can help you battle postpartum depression. In addition, it creates a special bond between you two. In order to get full benefits from a baby carrier, you must be sure that your baby feels comfortable and safe. Carriers that hold the baby really tight to your chest and up high enough for you to reach their top of the head for kissing is more than ideal. Just keep in mind that the baby’s head and back must have full support in the carrier. As the baby gets bigger, you’ll need a wider seat that distributes the weight evenly. It’s quite important to look for a carrier that is made from a soft and breathable fabric because the baby’s skin is directly exposed to the material. Weather is an important indicator of what to choose when shopping for baby items. The best baby carriers for summer should come in bright colors that don’t attract the heat from the sun. Used improperly, a baby carrier is a potential risk of suffocation, hip dysplasia, or dropping the baby. With this aspect in mind, you must learn first how to use adequately the carrier before attempting to carry the baby. If your baby is still a small infant, has a low weight or suffers from respiratory conditions, check a doctor’s opinion before using a sling. After you put the baby in the wrap or sling, make sure to check on him often. See if he’s in a good position and if the fabric allows his skin to breathe. Always look at the carrier and see if the baby’s face is visible and his eyes have a clear view towards you. After you nurse your child, reposition him so that his face is above the rim of the sling or wrap and away from the material. Most parents don’t mind carrying their child even when the weight reaches more than 20 pounds. But after a while, you might find the pressure put on your shoulders, neck, and back a little too big. A good choice is to find a baby carrier with wide and well-padded straps, which offers the possibility of wearing a waistband. This makes a huge difference because it takes off the baby’s weight from your shoulders and adds extra comfort. Good padding is essential as well because you need to be able to use your hands without having skin marks or bruises.